Description Defends your base from the Alien Assault. Hordes of alien creatures are trying to blow up your buildings. Make sure you keep hope alive for humanity by destroying them all, before they get a chance to do the same to you. At the start of each wave you will be shown where the enemy invasion is coming from, so be sure to use those few seconds to rearrange your troops and come up with a strategy. 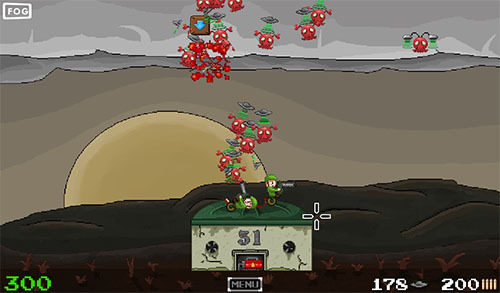 Take command of your little soldiers and decide where they will shoot.